The GridView control allows editing on a row-by-row basis. 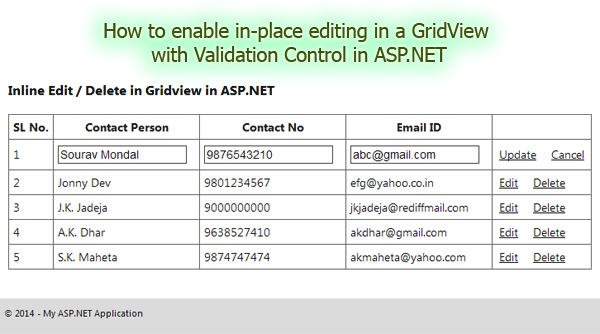 Here I am writing this article to explain how to enable in-place editing with validation control in a GridView in ASP.NET. Step-5: Add a Webpage and Design for Show Data in Gridview which rows are editable. <asp:GridView ID="gvContact" runat="server" AutoGenerateColumns="false" CellSpacing="5" CellPadding="5"
Step-6: Write following code in Page_Load event for Show data in Gridview. Step-7: Write below code in Gridview RowEditing event for make particular row editable. Step-8: Write below code in Gridview RowCancelingEdit event for cancel row editing. Step-9: Write below code in Gridview RowDeleting event for delete record from database. Step-10: Write below code in Gridview RowUpdating event for update database record.